Click here for an Instant Quotation! New cutting edge highly configurable spirometer. Features; FVC, FVL and MVV testing. The graphic curve display allows quick assessment of results. Meets ATS recommendation for diagnostic spirometry. New simple, easy to use spirometer is ideal for the simple assessment of lung health in the office setting. Features FVC testing. Meets ATS recommendation for diagnostic spirometry. Click here to view a PDF file showing CPT codes used for diagnostic spirometry! Click here to view a PDF file showing average reimbursements and return on investment! Click here to see your Instant Quotation on the most popular EasyOne configurations! Diagnostic: FVC, FIVC, FEV1, FEV1/FVC%, FEV6, FEV1/FEV6%, FEF25-75, PEF, FET, PIF, MVV, pre-post % change, variability, quality grades. Frontline: FEV1, FEV6, FEV1/FEV6, FVC, FEV1/FVC, PEF, pre-post % change, variability, quality grades. Diagnostic: FVC, F/V Loop, MVV, Post Medication Comparison. Frontline: FVC, Post Medication Comparison. EasyOne meets or exceeds published recommendations of the American Thoracic Society (ATS), OSHA Cotton Dust. FDA 510k approved. CE Certificate. CSA Certificate. ndd is ISO 9001 and EN46001 certified. 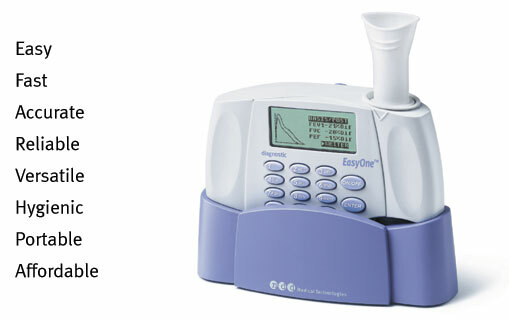 Click here to view an instant quotation on the Easy One Spirometers!